Working from home can seem and even feel at first like you’re living the dream. Everyone imagines sitting at home from the comfort of your bed, in your pyjamas, eating whatever you want whenever you want, setting your own routine and being your own boss. But like anything in life, there are also some negatives that come alongside the perks. The reality of the situation is that it can be tough and challenging. But also flexible and can fit around you. You just have to make it work for you. One of the perks of working from home is that you have the option to be flexible with your time. This means that you basically call the shots and you have the chance to decide what you do when. I have full rain over what time I get up, when I start working, when I take breaks and when I finish. Because of this, you do have to be strict with yourself, which also means that people expect you to be free all the time. But you have to learn to remind people (and yourself) that you still need to get things done even when you do work from home. To really this possible, you have to be adaptable in your schedule and move things around to fit any important plans you have coming up. Since you do have what can sometimes seem like all the free time in the world, it can be hard to not make most of the time you do have. When you are in the comfort of your own home most of the time, it can seem like days are pretty long. You can sometimes forget about how time consuming some tasks can be because of the freedom of time. So it is good to make use of the time you have and not waste it. Having a job that basically means I have to be online quite a lot of the time, it does mean my phone is always close by or firmly in my hand pretty much most of the day. It can be hard to keep yourself focused on your task with notifications popping up beside you and the urge to send your best mate a snapchat halfway through the afternoon. Sure there are times when I allow myself to go on my phone for a short while or to get back to a message, but it’s important to regain your focus, otherwise you will lose motivation and valuable time. That’s why it is always good to set yourself goals and a brief schedule to work towards everyday and know that any distractions as such can always be visited during a break or after your working hours to consume and enjoy then. I’m quite lucky in the sense that I live at home with my family and there’s always at least someone here with me throughout the day, but even then I can find it pretty lonely. You are just a one man band, calling the shots and being your own boss. It can be hard on low days where your motivation is zero and you’re not feeling your best to pick yourself up. Sometimes I’d love a team behind me encouraging me on. But from doing this, it has got me working harder on being my own best cheerleader and pushing myself when I need that extra bit of support. You do get use to being on your own and I have learnt to be comfortable with my own company. But it would be nice to have someone there once and a while, you know? Once thing I’ve noticed lately is that I’m feeling a lot more comfortable lately with how things are and honestly I’m not sure I’m such a fan of living life in the comfort zone. I mean sure there are somethings in my life that I sometimes avoid because of my anxiety disorder, but it would be nice sometimes to be pushed outside my comfort zone more in terms of my work. This one is definitely a work in progress right now. Because everything is basically done online, it can be so hard to switch my brain from blog mode and into chill the f*ck out mode. I’ve been trying to find some activities I can do in the evenings away from my phone or laptop to help switch my brain off. I love watching movies or TV shows, reading or journalling. I think I’ll always be on the quest to find the balance between blog time and free time. I don’t think there ever is a really happy medium between the two. It will always probably sway one way or the other. It can be so hard not to check my emails, look at comments, endless scrolling on social media and thinking of new ideas for posts and ways to work. My mind is always ticking. Now this one may come across quite controversial, because I don’t mean that blogging is lazy at all, but I mean from the sense that sitting at a computer all day can feel pretty lazy. I always try and get myself out of the house in the morning, so I start my day off the right way and ensure I’m getting a form of exercise before I sit down to work. You really do have to make that extra bit of effort to get out and not be stuck inside no matter how busy your to do list is, otherwise it can make you feel down and groggy. A bit of fresh air never hurt anyone and it will honestly do you the world of good. 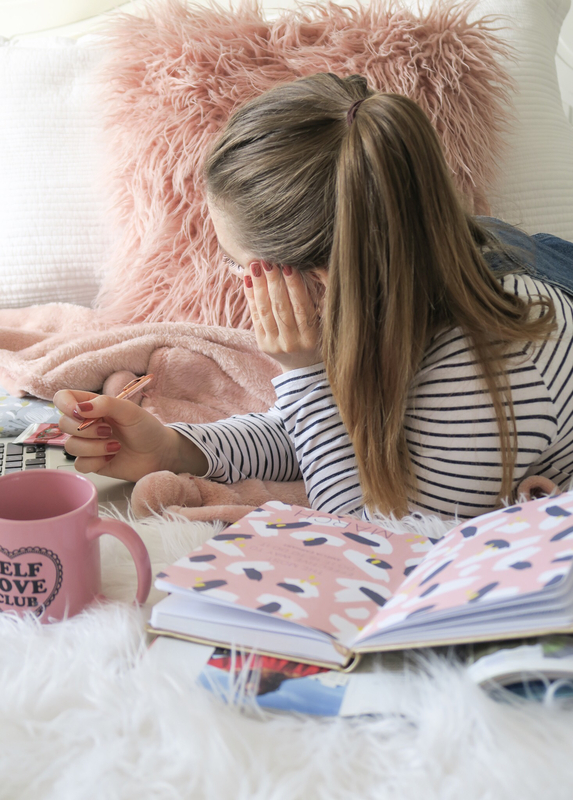 When doing work from home I find my biggest problems are – When I’m easily distracted and when I can’t seem to switch off my brain and relax – is frustrating because I tend to work to the point of burning out!